Geek Pinoy Give Away Winner! I am an anime geek. I am such a geek that I named my first dog after Sailormoon. My passwords are Nihonggo characters I love from Ghibli. And on my wedding day, I marched the red carpet while the band plays "Voices" from the soundtrack of Macross. Nobody knew what the song was except for a fellow anime geek who was waiting for me at the end of the aisle. Thanks for melting our geek hearts Noria. 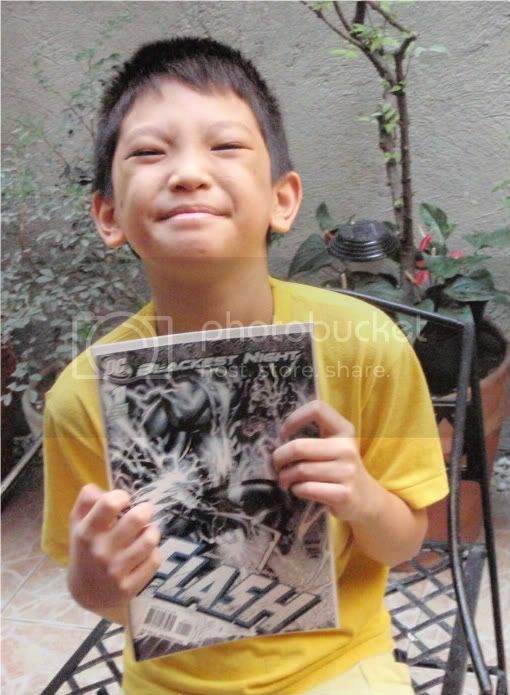 And for that she won an issue of DC's Blackest Night Flash #1 which is proudly displayed by her cute son on the left. It pays to be a geek especially when you're Pinoy! Stay tuned as we have more stuff to give away! I want a giveaway prize, too. Thanks again Jab for such an awesome prize!! !